Included in the OZ Experience Bus Pass that Fraser and myself were using to travel up the East Coast of Australia was an overnight stop at a cattle station in Kroombit. Somewhere between Hervey Bay and Rockhampton our driver had taken a slip-road off the main highway and with the Outback horror film Wolf Creek playing on the T.V up front we were now bursting along dirt tracks towards a vast expanse of nothingness. In such a desolate environment thoughts begin to creep into one’s mind of nightmare-ish scenarios but thankfully we were in the company of a top Londoner called David and two class Irish girls in Rhiannon and Charlotte to keep the mood light. As the mid-day sun shone high in the sky our bus pulled into the entrance of the ranch where we would be making kip for the night. A couple of years back some sharp farmers had the lucrative idea of converting their outhouses into bunks for backpackers wishing to ‘live the outback dream’ and ‘feel the cowboy vibes’, and now they entertain coach-loads of tourists with activities such as horse riding, clay pigeon shooting, and quad biking. 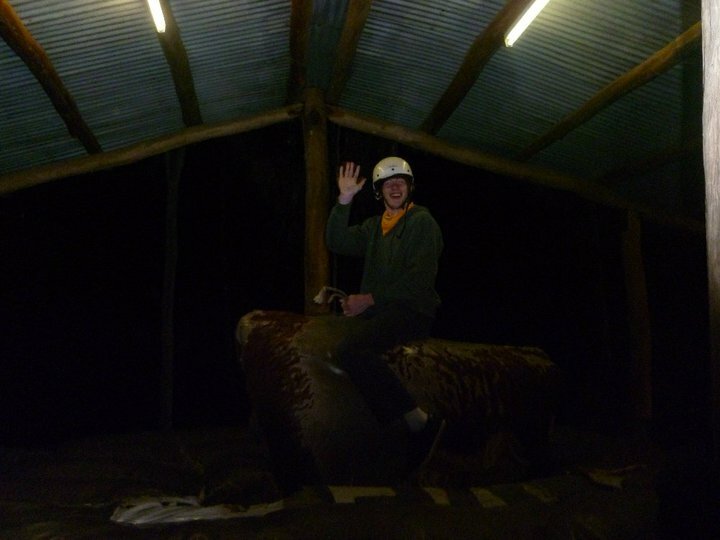 What better an opportunity therefore to tick item #85 off the bucket list: Become a Cowboy for the Day. We were welcomed with open arms by the staff and immediately treated to a hearty lunch of spit-roasted pork before being given access to the whole ranch for the afternoon. A bunch of us decided to go go for a wander up the hill to the back of the farm and after a nice half-hour stroll were greeted with a fantastic panorama of the barren surroundings. At the summit was a signpost that gave the distances and directions to a number of different capital cities around the globe – Fraser and myself were approximately 9,800 miles from home! Turning to head back down we noticed that one of the other girls who had joined us was having extreme difficulty managing her footing across the rocks and loose impediments that littered the path. Soon to garner the nickname ‘Unbalanced Girl’ for the rest of her Aussie trip, Miram explained to us with a wry grin that when her mother accidentally dropped her on her head as a child she lost all sense of stability and to this day still finds it difficult to manoeuvre her way on unfirm terrain. This out-of-the-blue statement caused each member of the group to react in one of two ways, neither very sympathetic. Charlotte, Fraser and myself immediately burst out into hysterical hyena laughter whilst Rhiannon and David just stood there with frozen expressions of perplexity on their faces. A couple of long seconds passed before it became quite apparent however that this wasn’t a joke and she was being completely serious. Using all our strength we managed to regain enough composure to help her slowly back down to camp where we’d been told to rendezvous at 4pm, but the sniggering failed to subside until a good while later…. at which time we were standing in the middle of a pen, swinging lassos, and facing a trip of pissed-off goats. 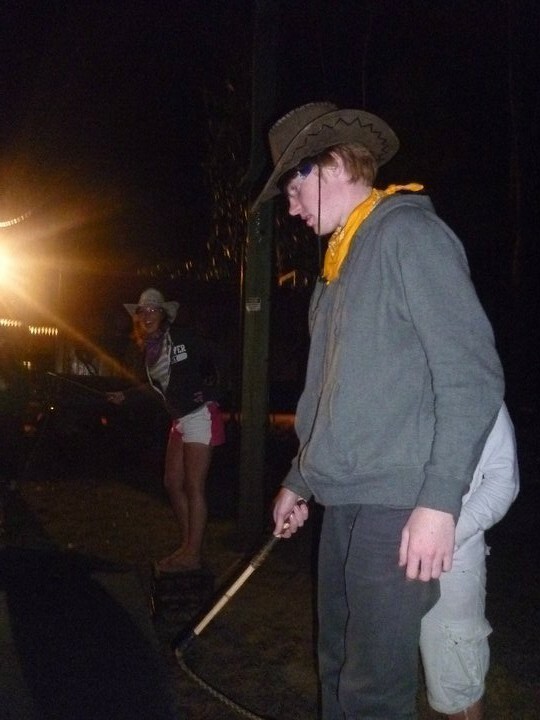 Our first step to becoming fully-fledged cowboys and cowgirls was to learn how to tame farmyard animals and having been placed into teams of three we were pit against the clock with the challenge of ‘goat herding’. The goal was simple: restrain it by its horns, flip it on its side, then pretend to mark it with a cold branding iron. My duty was as chief lasso thrower, but despite having consumed dozens of hours of Western movies found the technique a little harder than imagined, not being aided in the slightest by the fact the goats had decided at this moment to race around the pen like it were some form of NASCAR circuit. After up-teen failed attempts I eventually managed to target one of the slower, fatter, members of the now mosh-pitting mammals, and bringing it to its knees we managed to get the animal branded in a not so brilliant time; by which I mean we finished dead last! Wanting to live up to their cowboy reputation, the ranch-hands insisted that the bull be set to the most difficult level – 6 seconds being the time to aim for and keeping in line with that target of the professional rodeo clowns. Well let me tell you, I don’t think that even cumulatively our group of students would have reached that target. As the bull lurched into life, one-by-one we flew straight off the front of the machine as the bull twisted and turned like it was performing a rhythmic gymnastic routine; the boys each suffering nasty knocks in the ‘cojones’ department for their efforts. The only way any real cowboy would numb such pain is with liqueur so grabbing some beers at the make-shift tiki bar we huddled around the wooden tables and ended up entering into a random game of al-fresco strip poker; our take on the traditional closing mexican stand-off. I’d say that in our own individual ways we’d each earned our spurs that day and were able to leave the next morning with stomachs full of ‘Cowboy Caviar’ (their name for beans on toast) and cowboy hats firmly on our heads. Guess you’ll have to try again and perfect that bull ride! !